When Opcare opened a new centre in Winnall Trade Park in Winchester, they did not originally include a mezzanine floor in their plans. However they soon realised that there was a large amount of space not utilised above their heads & an idea was born. After initial discussions with Hampshire Mezzanine Floors, the local mezzanine floor specialists, it was established that a mezzanine could be fitted over the existing office, stores area & show room. The additional space created would be used for a larger storage area, office administration & a further showroom facility. 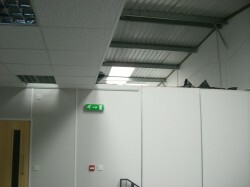 As the premises were now fully occupied, the mezzanine would have to be installed over the existing areas in phases to minimise disruption to the customers. A safe method of erection was devised to work over the top of the remaining walls, with only the lights & suspended ceiling being removed as the floor was installed. A new fire resisting ceiling & fire hoods were also fitted, re-using the client’s lights fittings & salvaging the original ceiling for re-use on the first floor. HMF also installed a full height fire curtain to maintain fire separation requirements as required by Building Regulations. HMF carried out the design of the project & organised Building Regulations Approval, providing a one stop shop service to the client. As Opcare work with people with varying disabilities, extra thought was given to DDA compliance. 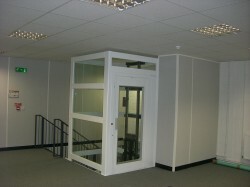 A Public Access Ambulant Document M type staircase was also designed & installed by Hampshire Mezzanine. 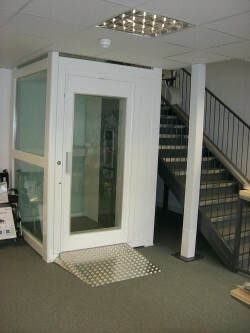 Opcare also installed their own bespoke disabled access lift as part of the new showroom facility. Now that the mezzanine floor has been successfully installed, Hampshire Mezzanine Floors have since been awarded the contract to install the stud partitioning, suspended ceilings, bagged insulation & decoration to the fit out project. Opcare benefitted from Hampshire Mezzanine’s vast experience in fitting mezzanine floors in industrial & commercial premises in the South of England, not only providing a top quality mezzanine floor but also providing full project design & health & safety management.